From the book description via goodreads.
. First and foremost I am going to say that I thought that books on angels and such were becoming overplayed. Well I Was Wrong!!!! 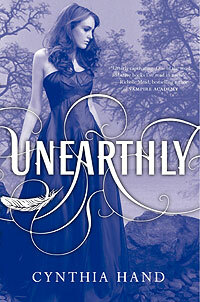 Unearthly is amazing. I couldn't believe how easily I got pulled into Clara's world I felt what she felt, cried when she cried, and rooted for her to complete her purpose and win the guy (I'm not saying which one as that would spoil the story). So lets talk about the guys you have Christian tall dark hair, deep green eyes, and brooding. Than there's Tucker who is a cowboy with blue eyes a tan and golden brown hair and so not brooding. I can say they are two completely different people and I normally go for tall dark and brooding but in this instance I fell in love with the cowboy Tucker almost immediately even with his snarky comments. He seemed more like a real person and I could see him in my mind not that I couldnt see Christian he just seemed too perfect and kinda shallow at times. I know some of you will not feel the same way but it's only my opinion right? On to Clara's friends and family. Angela and Wendy again they're two completely different people and each is there for Clara in different ways I have to admit I love them both. There's Clara's mom who is an Angel-blood as well as her younger brother Jeffrey who is also Angel-blood. Clara's mom is difficult to read sometimes she is completely loving and supportive and sometimes she is distant and absent but, when Clara needs her the most she is there. She is all about Clara finishing her purpose. Jeffrey on the otherhand is mad that they had to move and I believe a bit mischevious I'm not sure exactly what he's into Cynthia kind of leaves us hanging there. I'm sure we'll find out in the next book. Overall the bad guys are really bad and the good guys are awesome! I can't wait to find out what happens in the next book. Thanks to Netgalley and Harper Collins for the ARC. Since Rose is going up against Clara, I saw your review on your list and had to see what you thought! I'm glad you loved this! I did too and can't wait to read Hallowed! Tucker is...awesome! I loved him! I mean, I loved Christian too, but I'm so Team Tucker. Tucker seems more real to me as well, than Christian does.